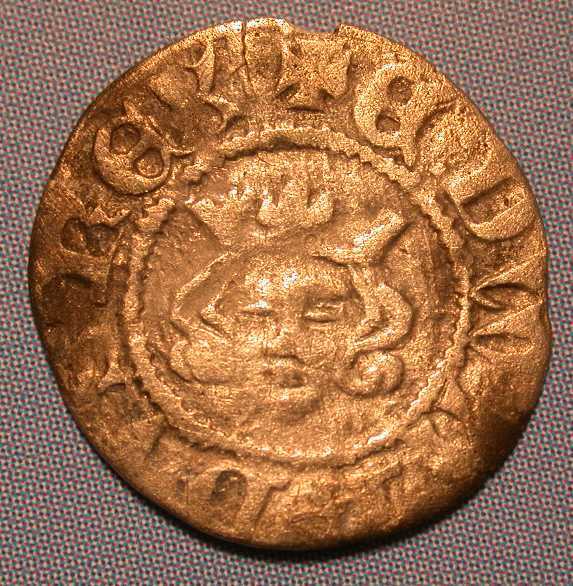 Farthings were struck in large quantities during the first decade of Edward III's reign, but by by the 1350's the quantity of farthings in circulation allowed for a significant reduction in the quantity of small change being minted. 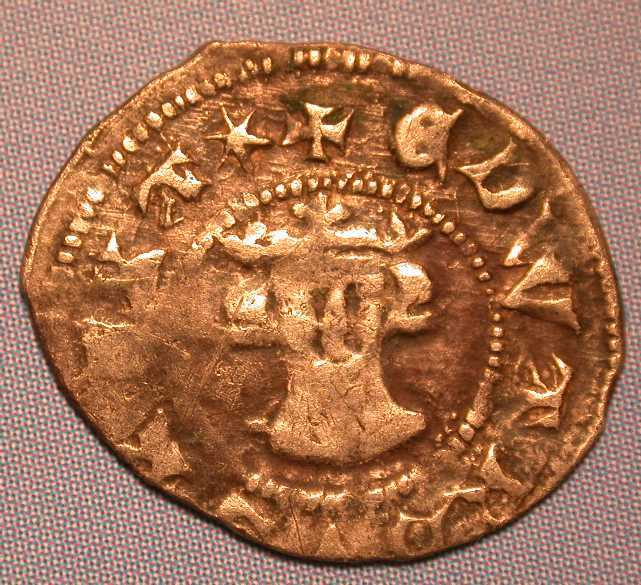 As such, all Pre-Treaty farthings (1351-61) are very rare - in 1960 only one example was known to exist. 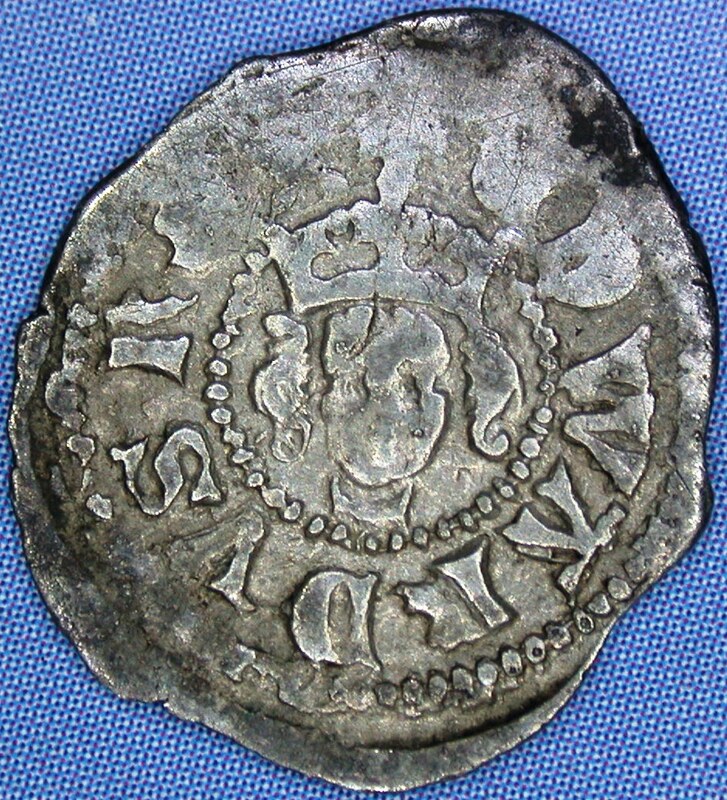 This is an interesting reign to collect - as there are a number of quite distinct types, some of which are extremely rare. 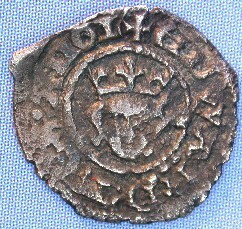 FIRST ISSUE (as Edward II Type 30-32). 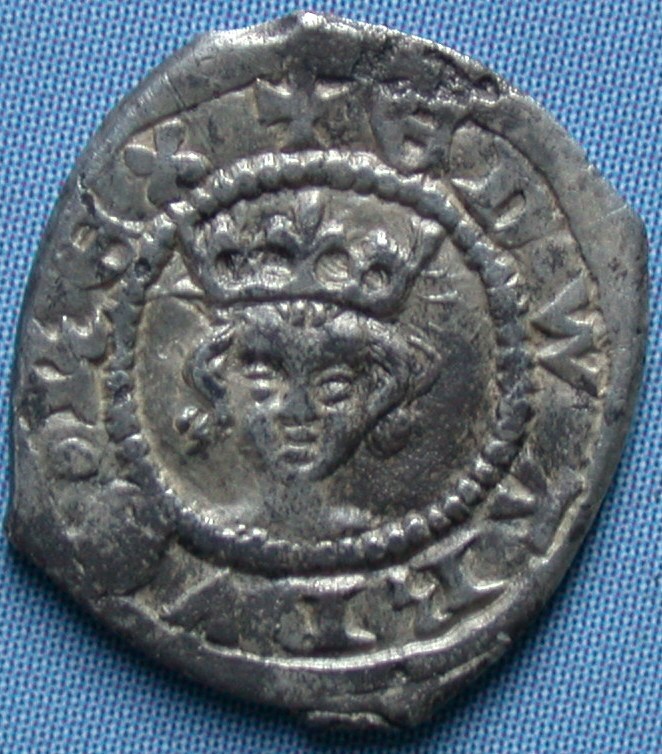 This coinage was struck between 4 February 1327 and 7 May 1335. 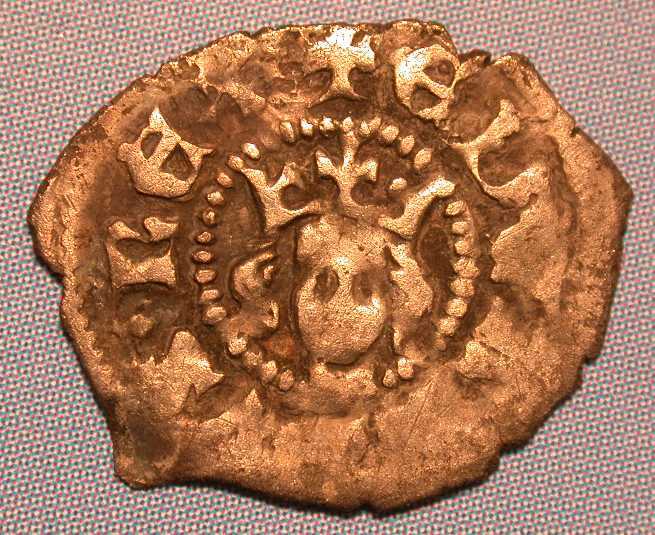 Based on the records published by Crump and Johnson, well over 3 million farthings were produced of this type. 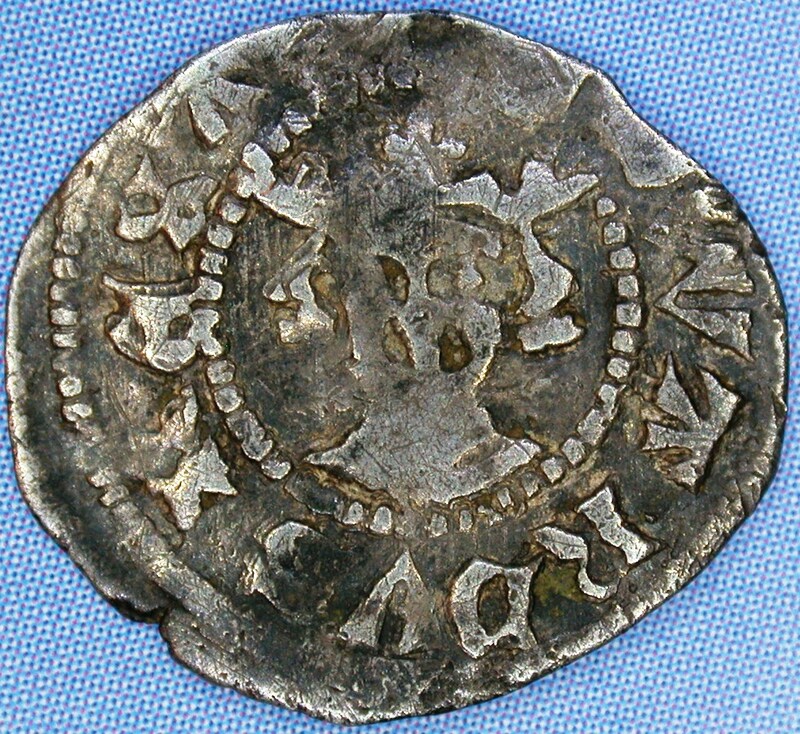 As with Type 31, this type is not as common as these minting records suggest and it must be assumed that dies continued to be used from earlier issues (e.g. 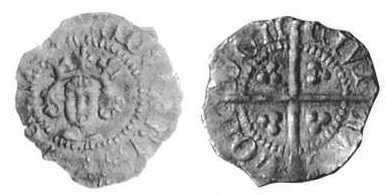 Withers Type 30). 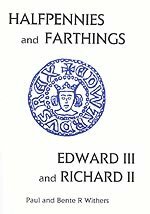 So, while minting records for London show that 3,250 pounds of silver was struck into farthings during this period (1327-1335), stylistically there is no way to distinguish them from those of Edward II. 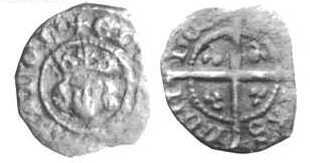 For details of this Type, please visit the Edward II - London mint page. 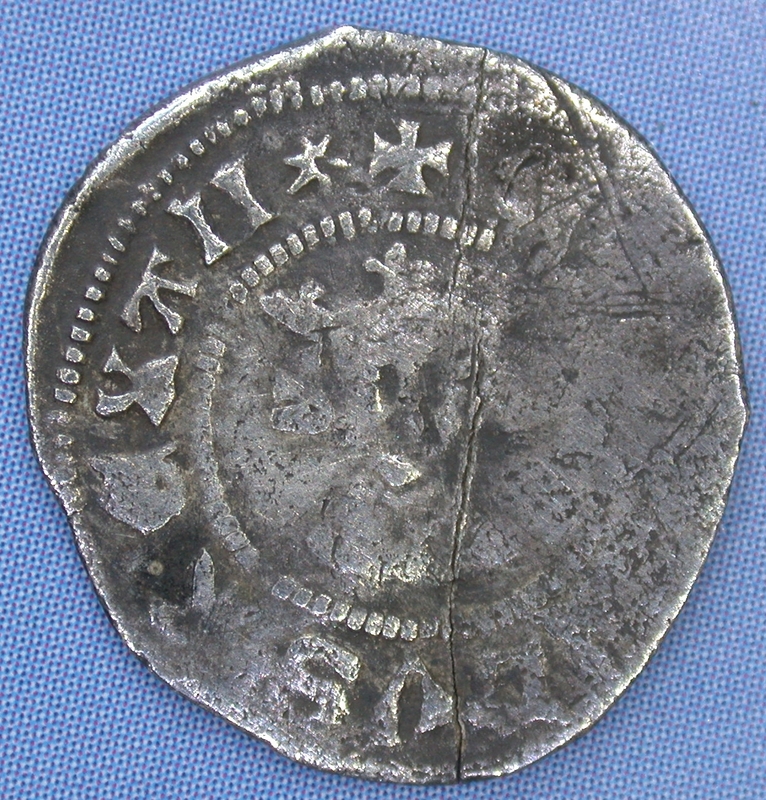 SECOND ISSUE, known as the STAR-MARKED coinage. 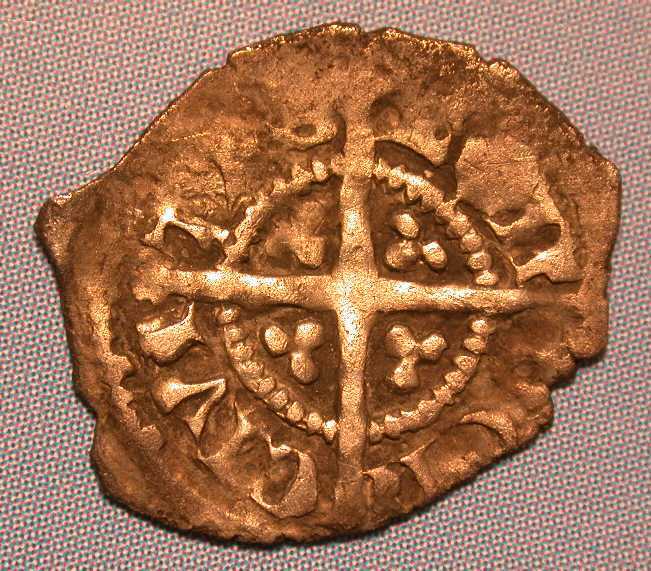 This coinage was struck between 8 May 1335 and 15 December 1343. 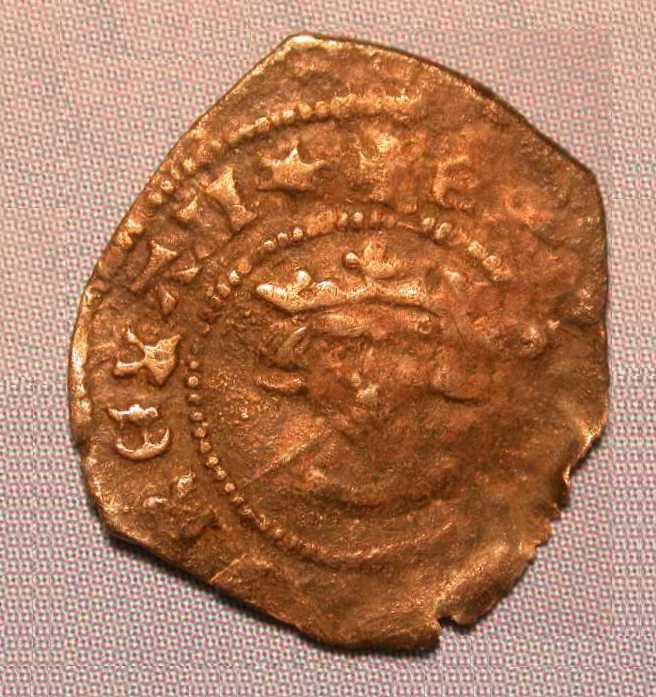 Based on the records published by Crump and Johnson, 5,639 pounds of silver was struck into farthings at the London mint (almost 5 million farthings). 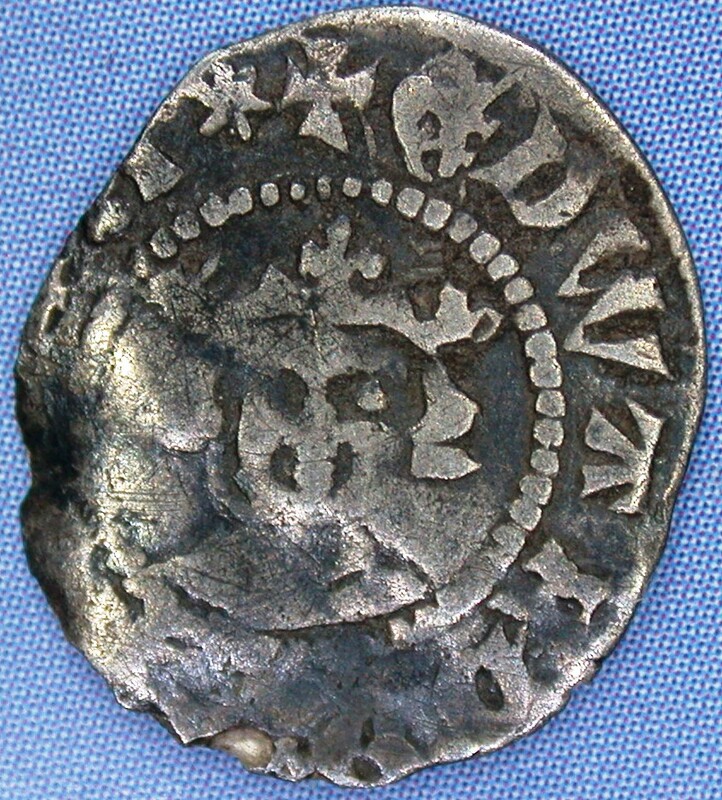 The weight of these farthings remained unchanged from those of the preceding reign of Edward II, but the fineness of the silver was reduced from sterling. fleurs. Fat stars or thinner asterisks. 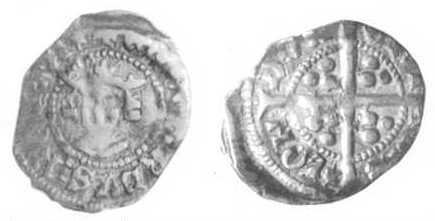 As Type 1a, but with a pellet between the R and E of REX. Small neat head. Low crown with no jewels between the fleurs. Fat stars or thinner asterisks. have a "bite" out of the right hand side. Normal or unbarred N's. Normal or unbarred N's. Fat stars or thinner asterisks. 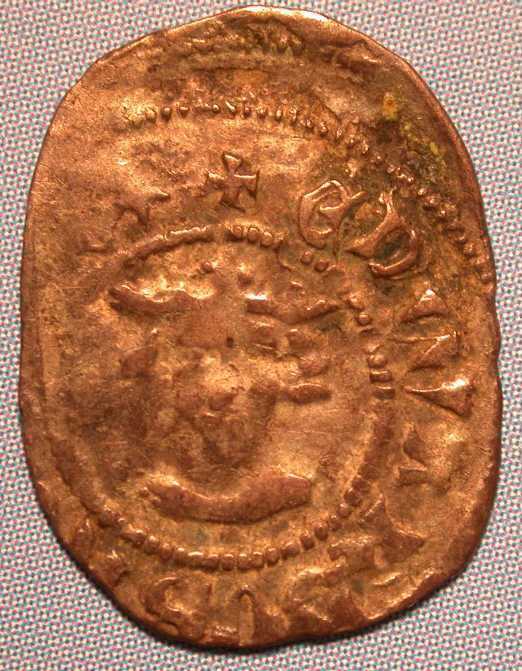 shows that both E's in the obverse legend are unbarred. 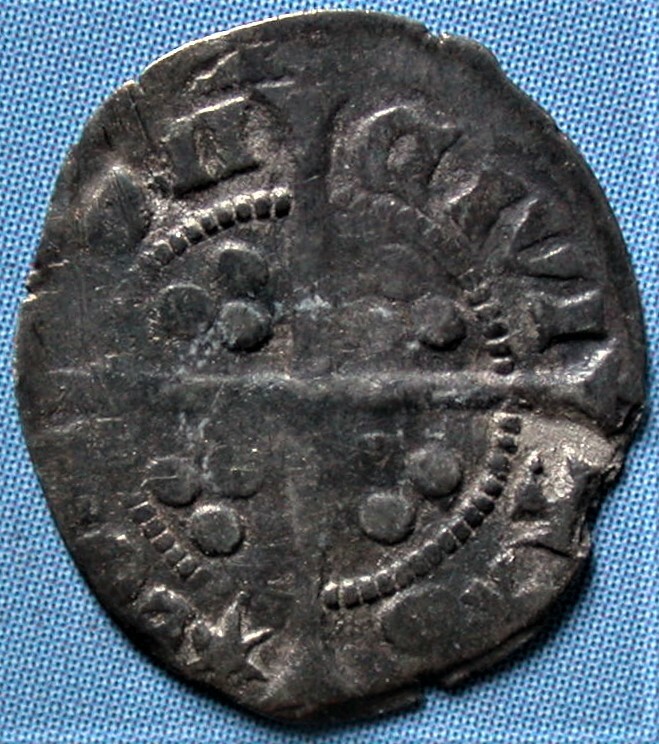 As Type 1b, but with a pellet between the R and E of REX. 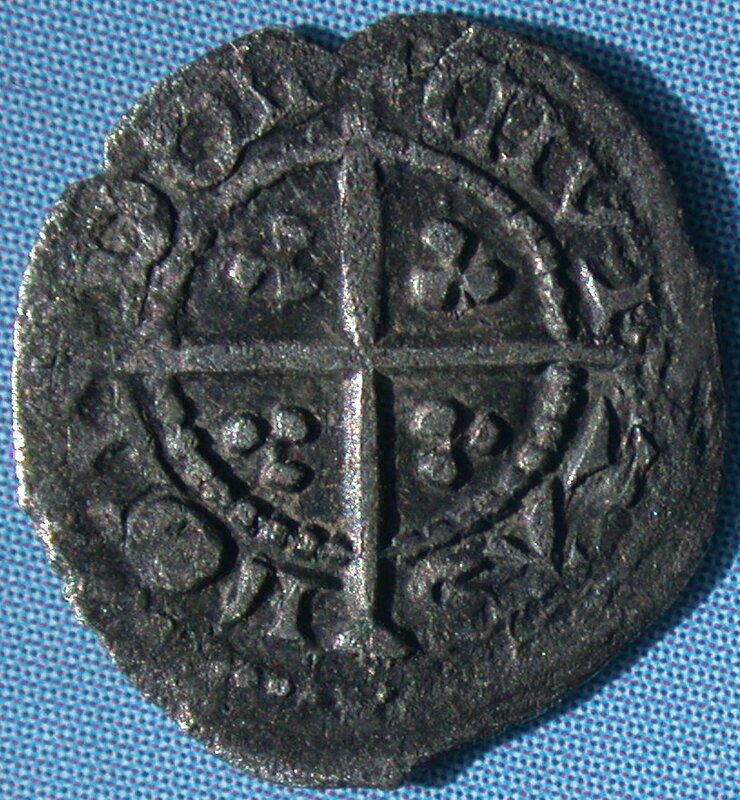 lombardic N's. Fat stars or thinner asterisks. A over T in TAS. Long face. Tall narrow crown with no jewels between the fleurs. Normal or unbarred N's. Fat stars or blobs with rays. 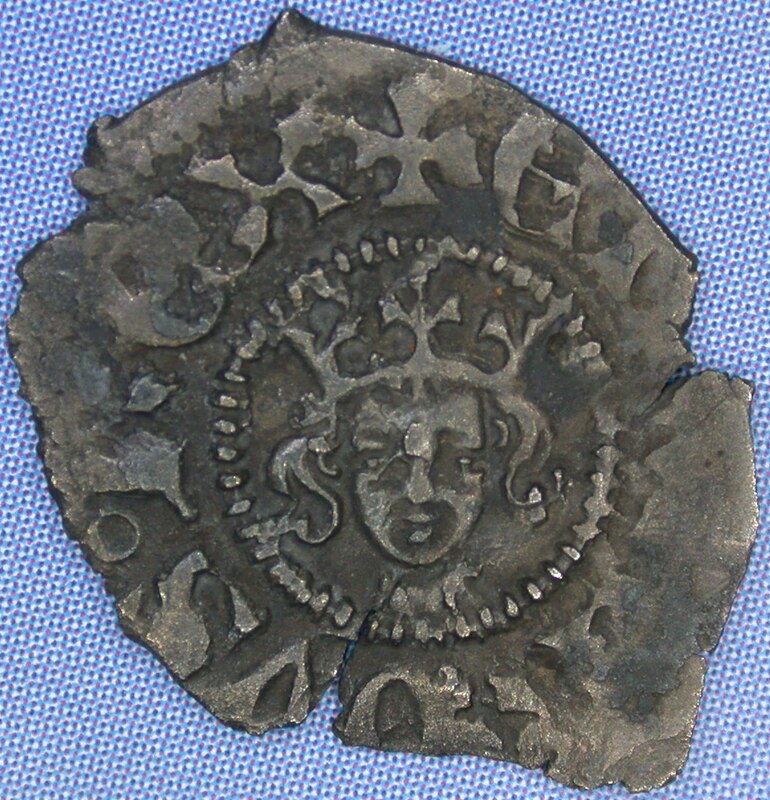 THIRD ISSUE, known as the FLORIN coinage. 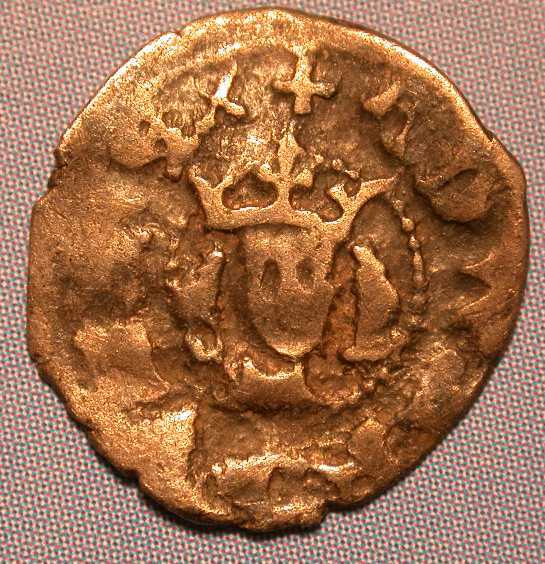 The weight of farthings was reduced to make the cost of producing them viable (i.e. 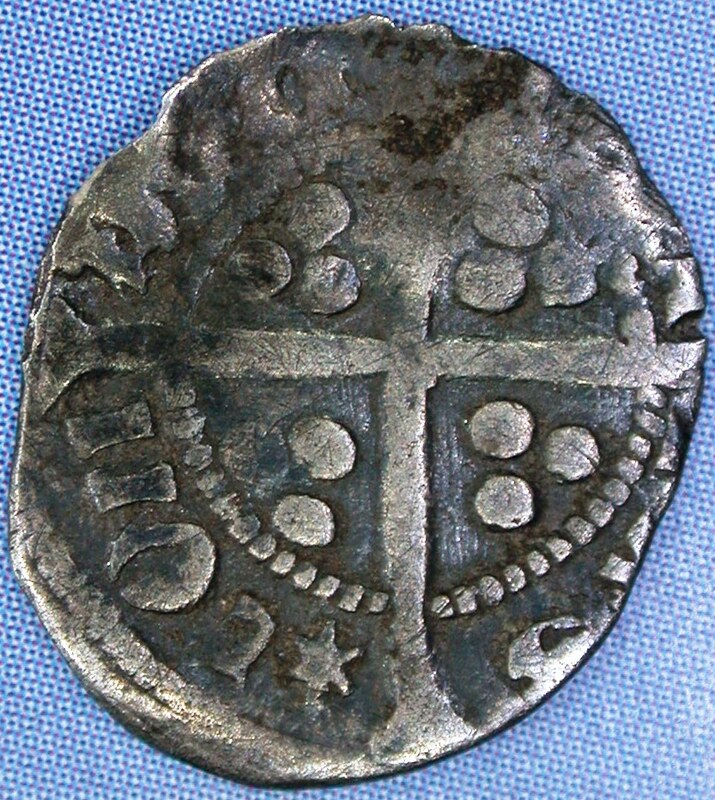 more farthings could be produced for every ounce of silver), and the fineness of the sliver was again increased back to sterling levels. separate or drop-shaped and touching. 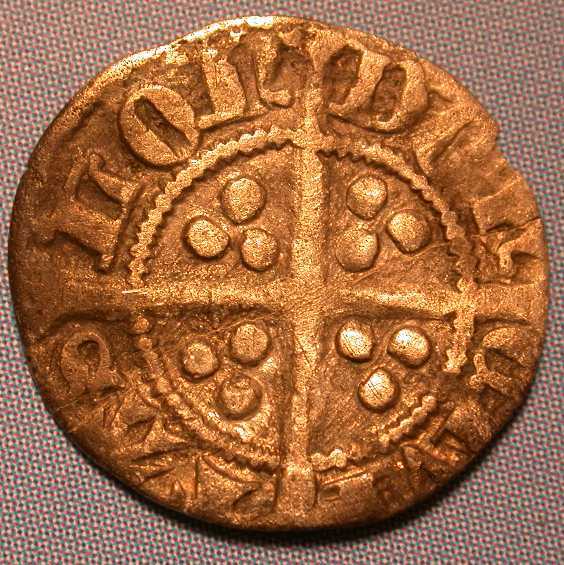 Lombardic N's. O in LON. 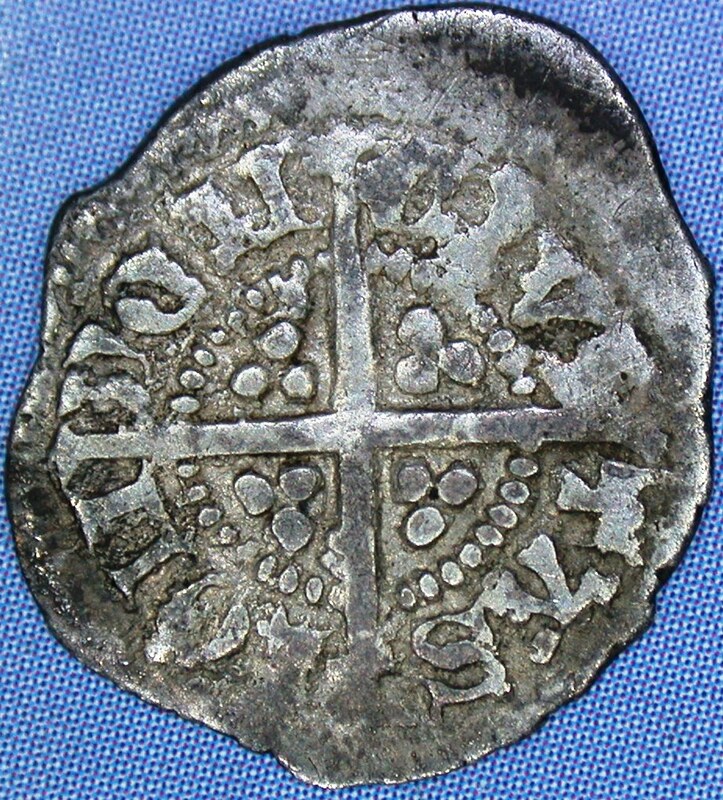 Lombardic N's. 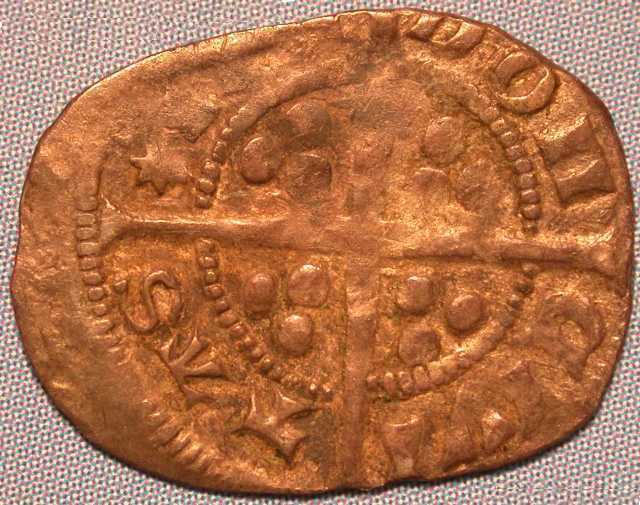 Once again, the weight of farthings was reduced to make the cost of producing them viable. 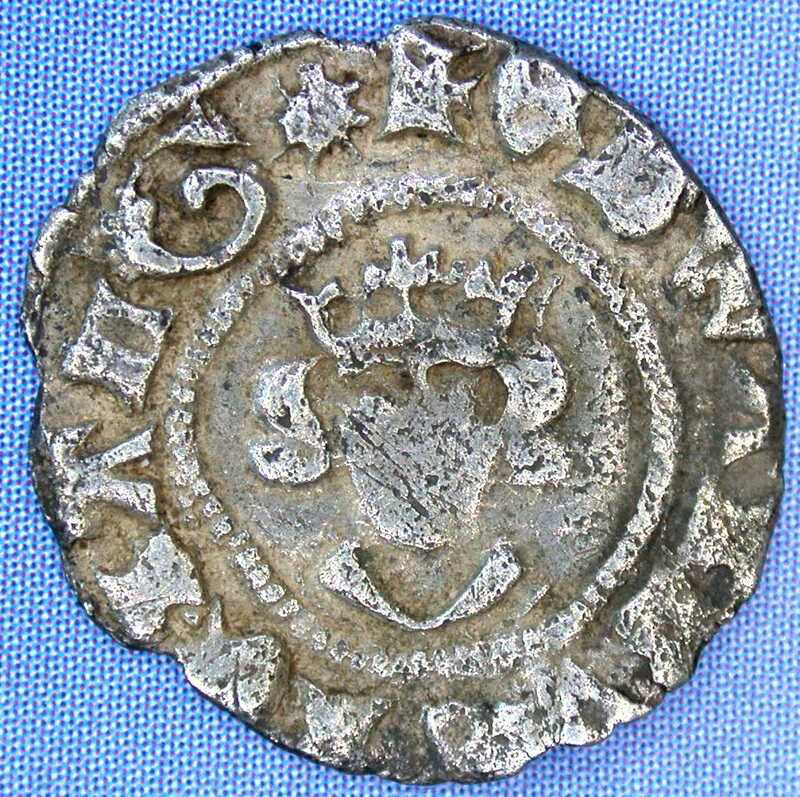 The treaty that is referred to in the naming of this period was the Treaty of Bretigny which was signed on 9 May 1360, between King Edward III of England and King John II (the Good) of France. It was the result of substantial military victories over France and through the treaty, for a brief period, England gained control over a vast portions of France. 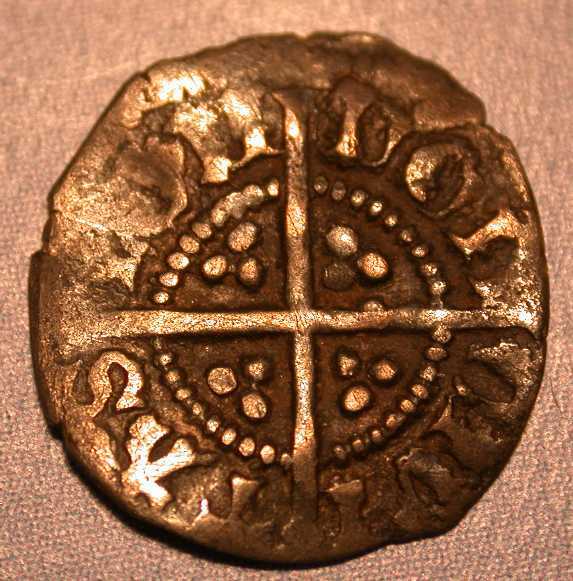 According to mint records, farthing production had ceased in 1351, and their production was not listed in the denominations authorised by the indentures of 1351, 1353, 1355, 1356 and 1361.3 It is an anomaly that Pre-Treaty farthings are known to have been struck during this period. no jewels. Annulet stop on obv. 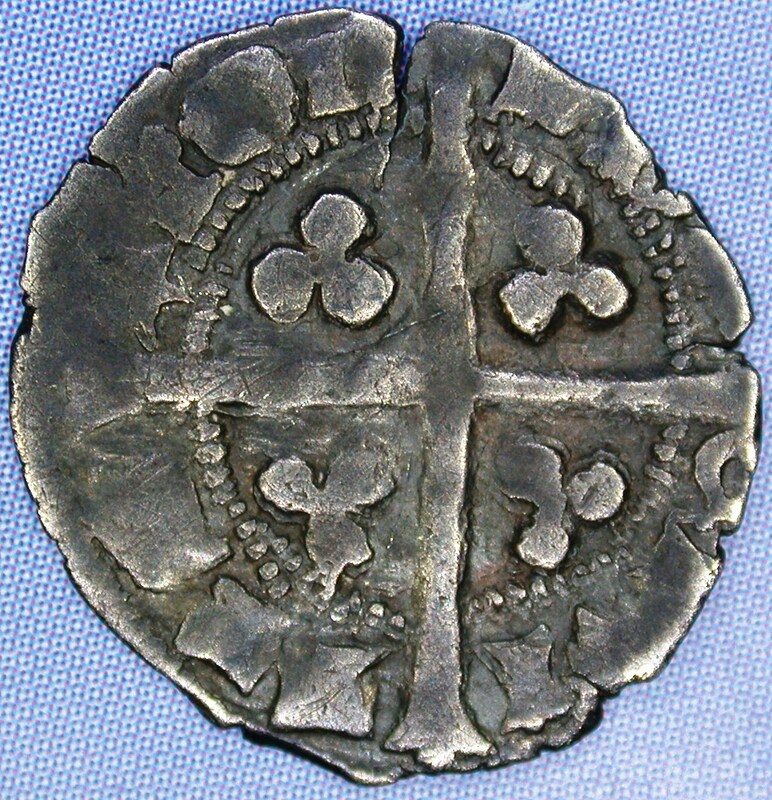 Long Cross" with three pellets in three quarters. Large thin lettering with Lombardic N's. Withers Small Change II, 2002 (illustrated). sides and no jewels. Annulet stop on obv. an annulet above the pellet in the outer circle! 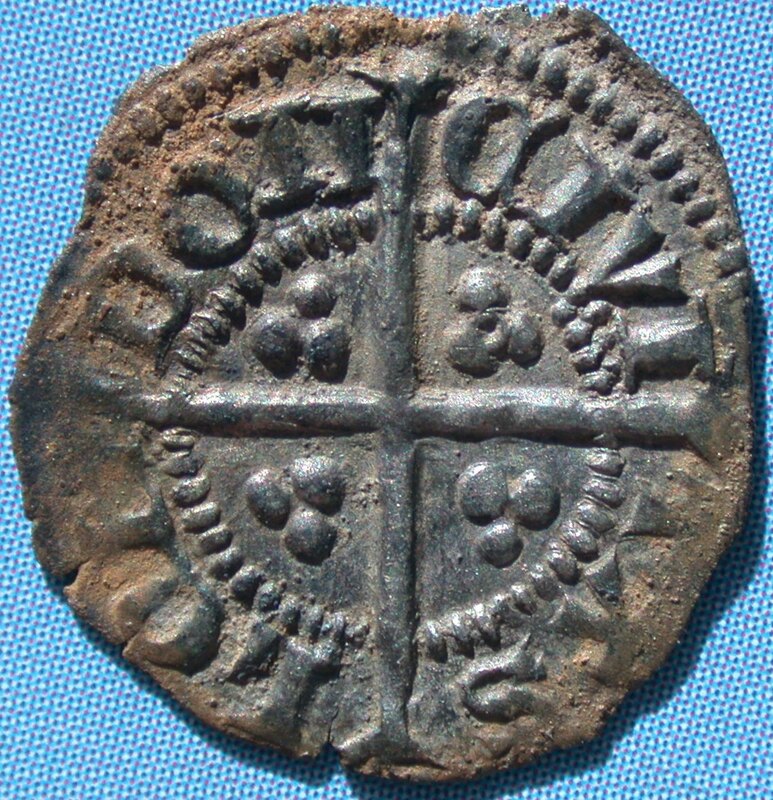 Possible annulet between the three pellets in the CIVI quarter. 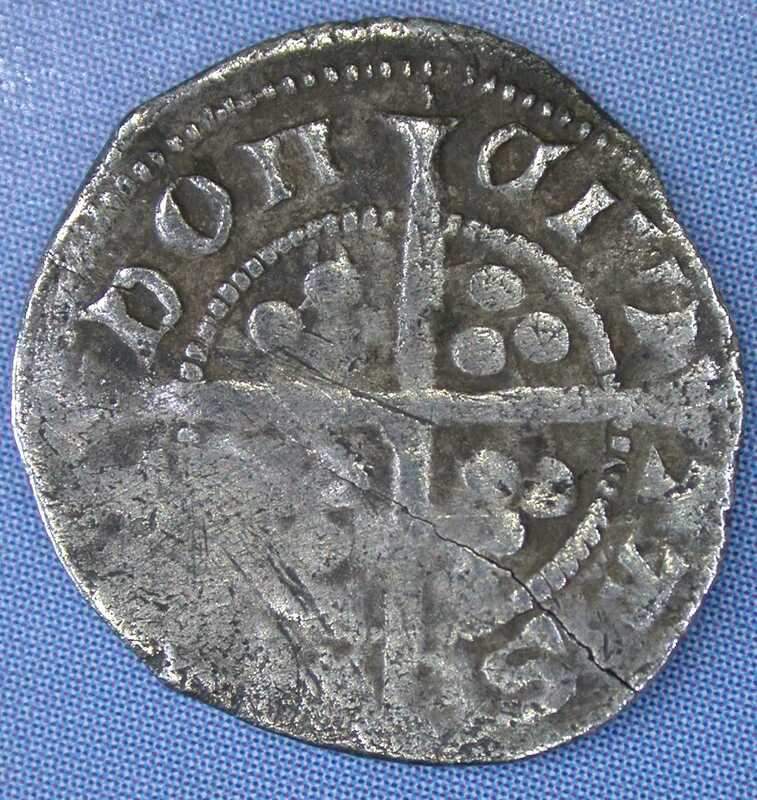 Annulet between the three pellets in the DOn quarter. BNJ, Vol. 62, pl. 8, no. 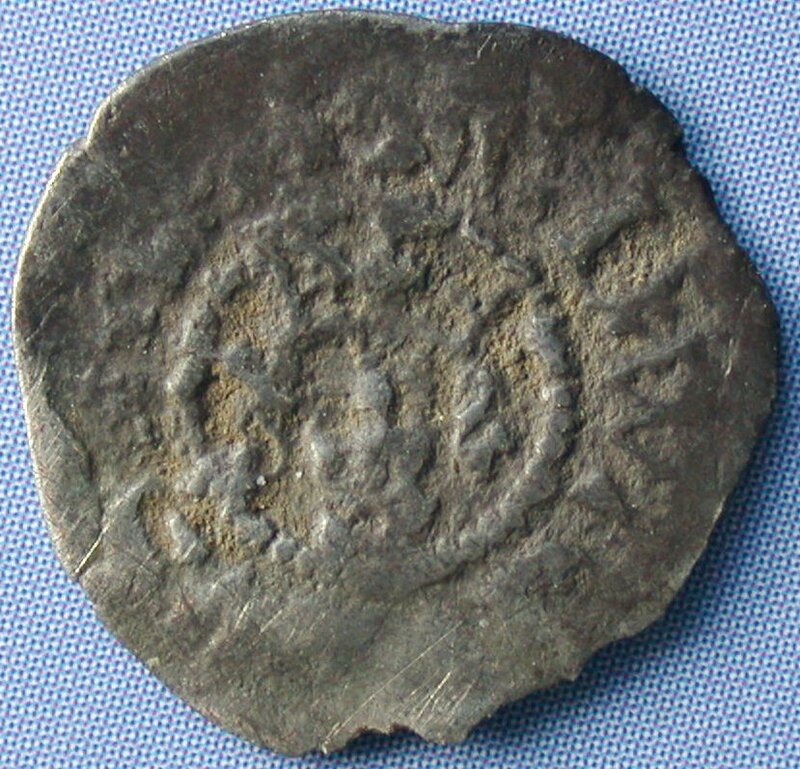 26 with a possible annulet in the DON quarter. (illustrated). sides and no jewels. No stop on obverse. 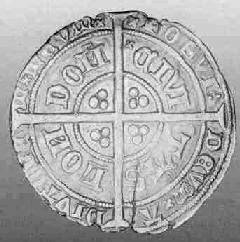 Small fish tail letters and Lombardic N's. Small fat letters with long serifs, waisted "O"
and Lombardic N's. 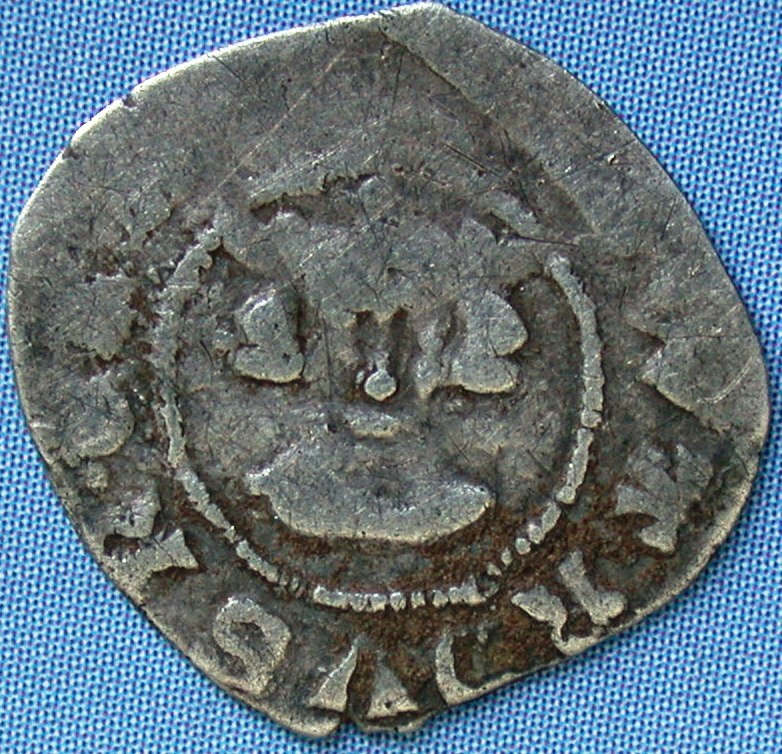 Annulet in CIVI quarter. sides and no jewels. 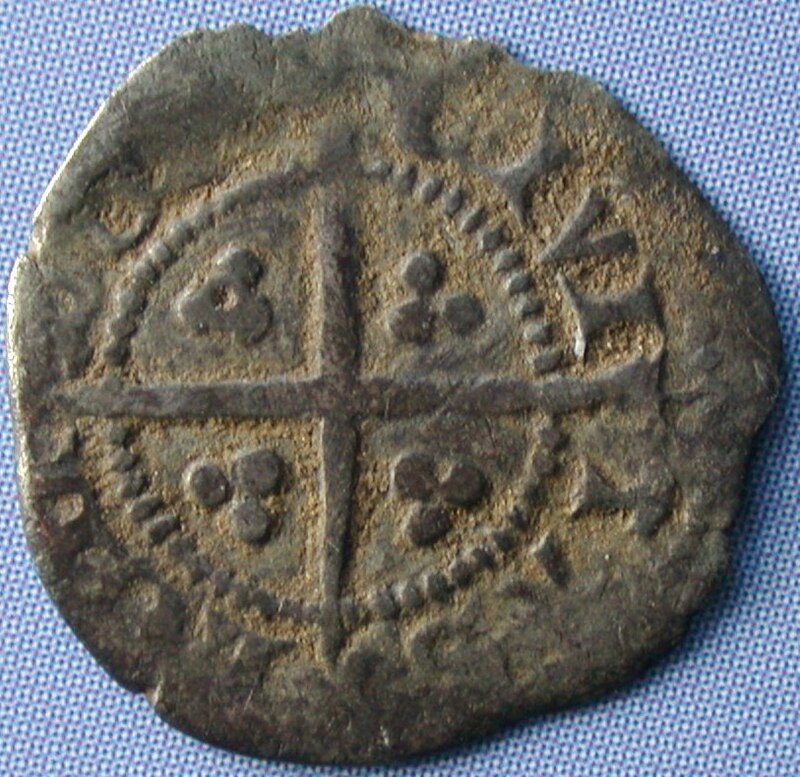 Pellet on obverse legend. thin on the right. 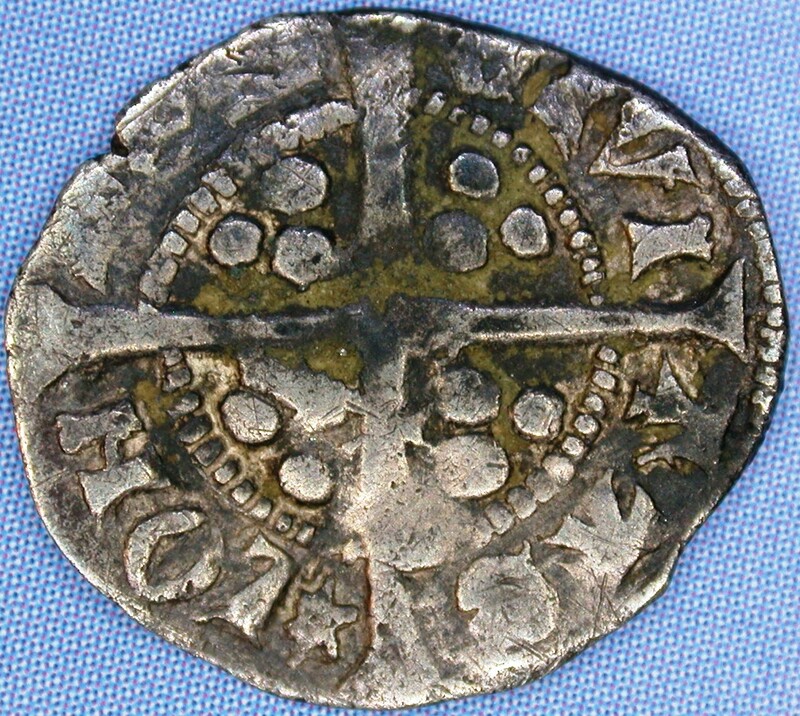 Lombardic N's. sides and no jewels. 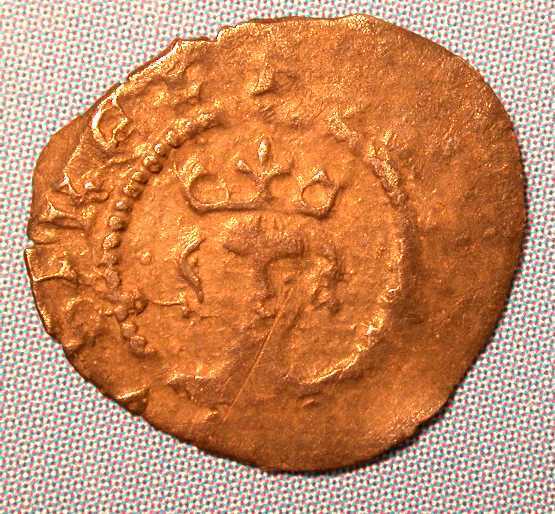 Colon on obverse legend. Thin lettering. 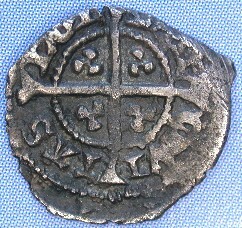 Annulet in the CIVI quarter. Spink Num. Circ. August 2001, Vol. CIX, No. 4, pl. 4 (same as example 2) (illustrated). Withers Small Change II (photo above), 2002. Thin lettering. 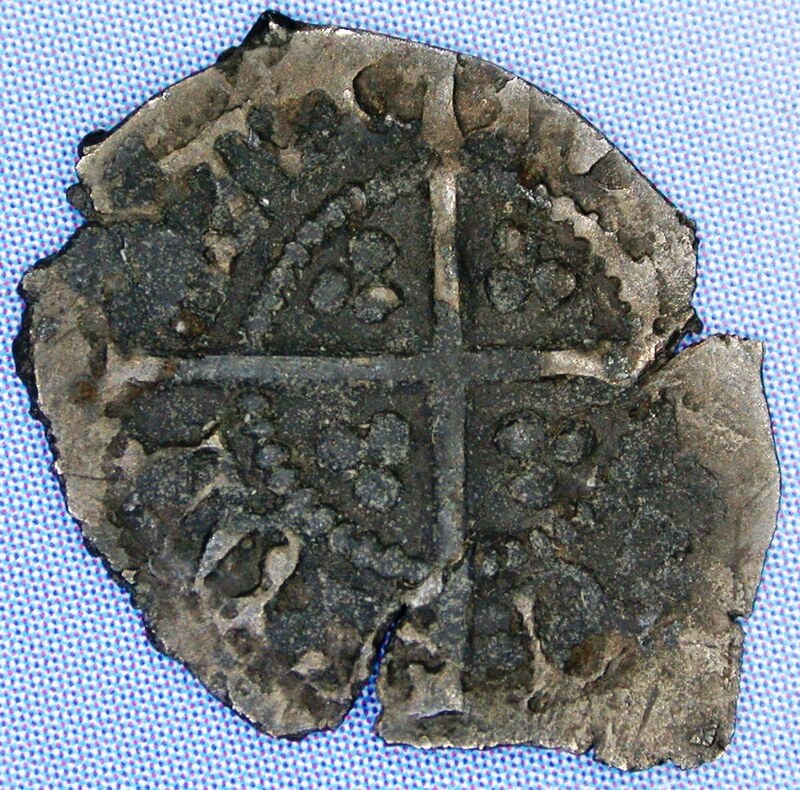 Annulet in the DOII quarter. stops in legend. Unbarred N.
Thin lettering and Lombardic N's. Spink Num. Circ. August 2001, Vol. CIX, No. 4, pl. 3 (same as example 1) (illustrated). 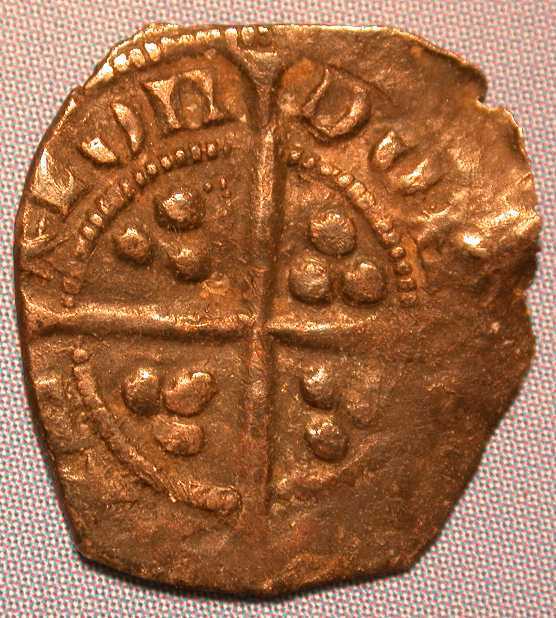 The London indenture of of 11 February 1363 and the Calais indenture of 1 March 1363 introduced an additional requirement to mint 100 pounds weight of farthings per annum (worth £125 - i.e. 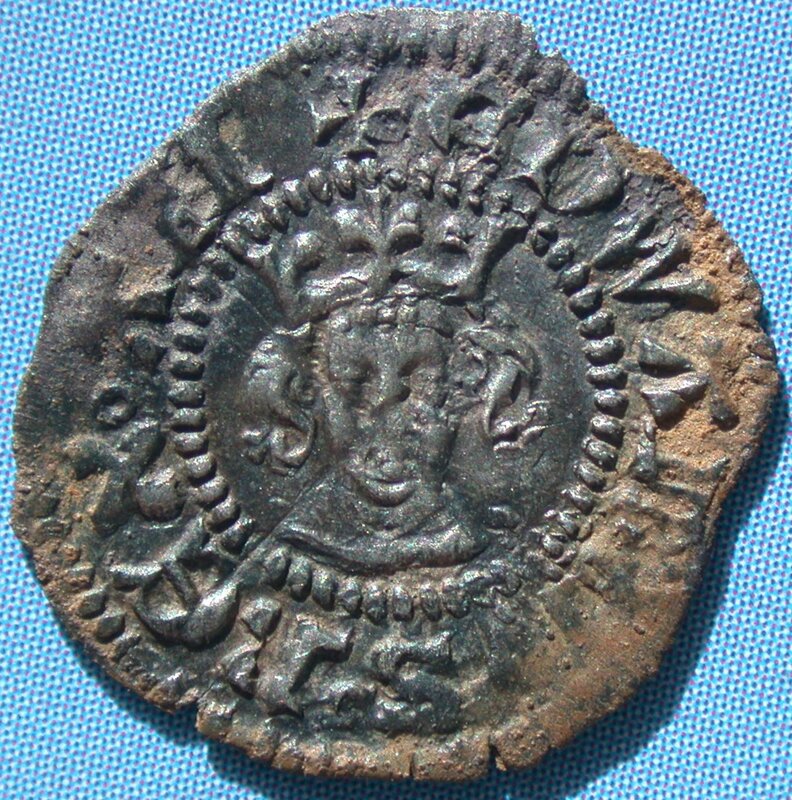 72,000 farthings)3. 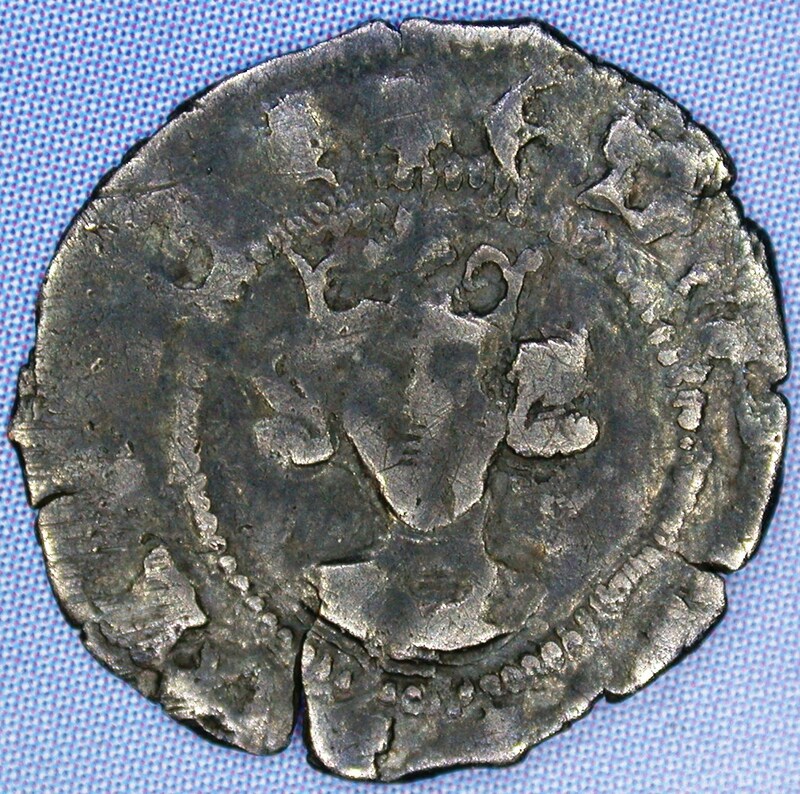 If any farthings were struck in Calais they have not been identified yet. Crown made of curved pieces. Small lettering with long serifs. Letter X in REX looks like a cross pattée struck sideways. hair as Type 8. 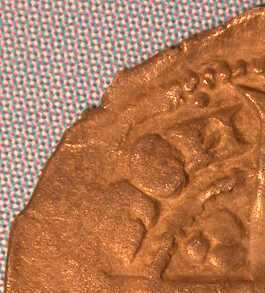 Pellet before REX on obverse legend and W as VV. N's". Pellet after LON on reverse legend. N's". Pellet over N of DON on reverse legend. Small inner circle. 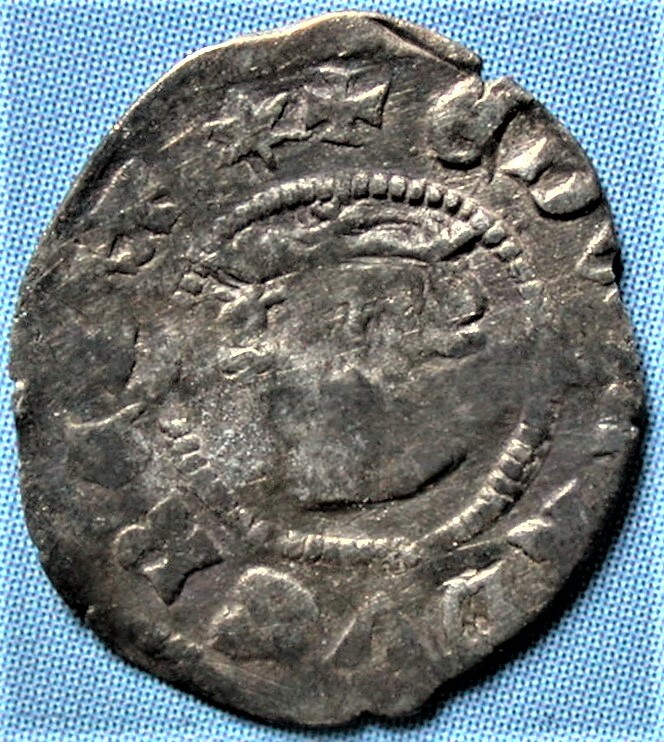 There were Calais indentures issued on 20 May 1371 and 20 May 1372 which required the mint to produce 100 pounds weight of farthings per annum (worth £125 - i.e. 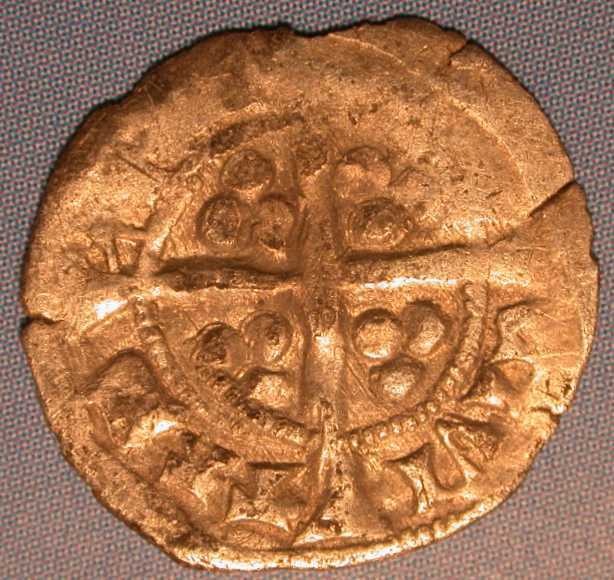 72,000 farthings)3. 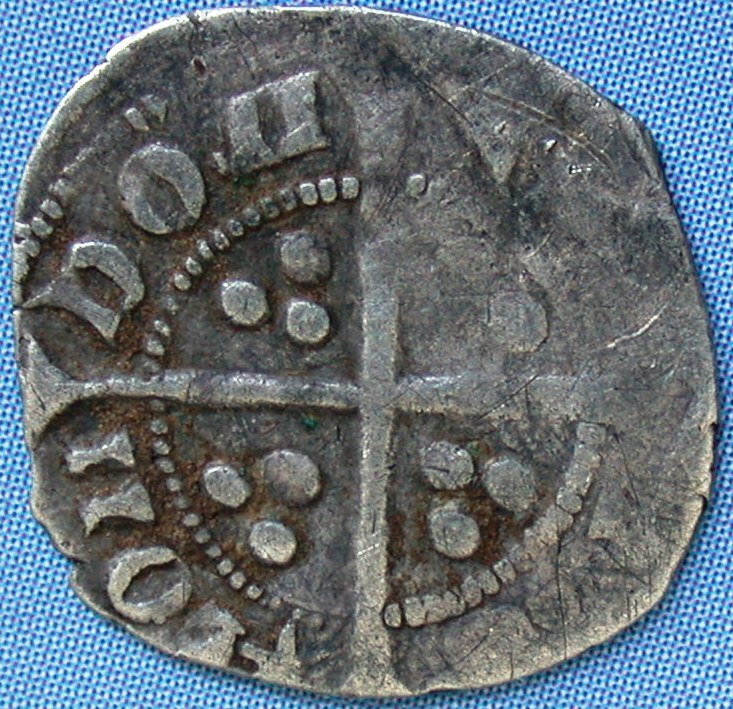 While examples of London farthings are known, if any farthings were struck in Calais they have not been identified yet. 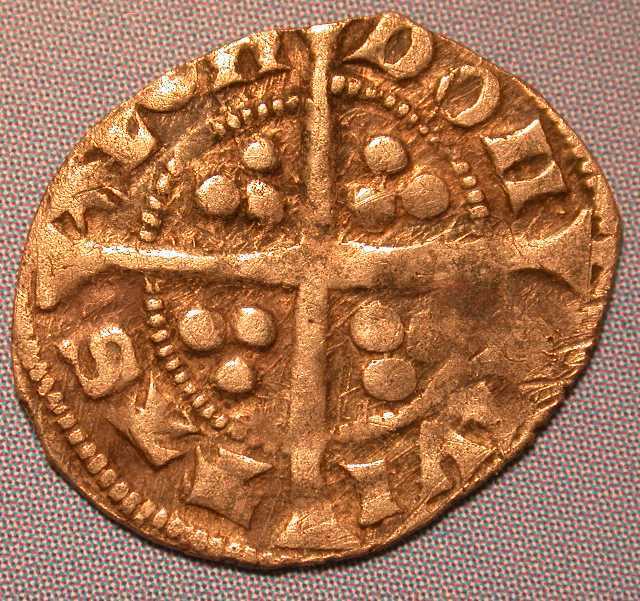 As with the later Richard II farthings, the diameter of the inner circle is only 5.5mm. 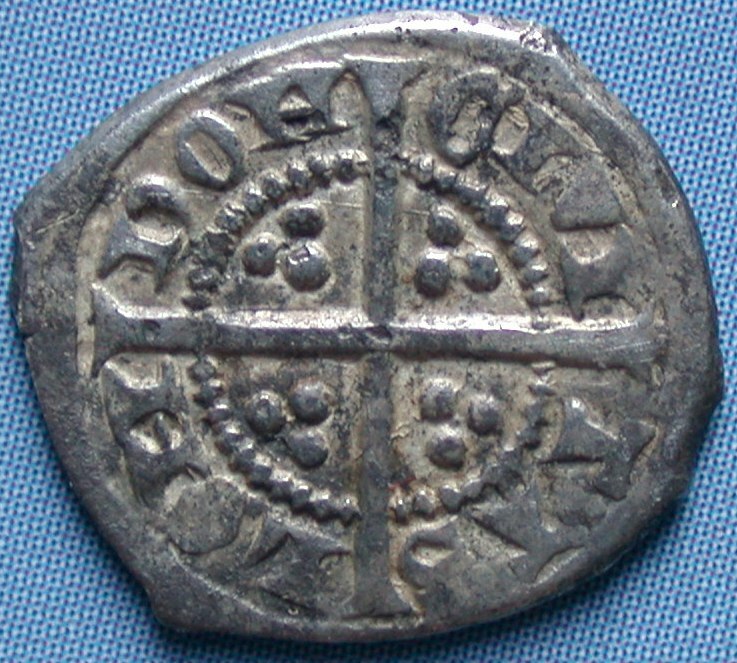 A distinguishing feature of the groats and halfgroats in this series is that the Ns on the reverse are backwards and the last N in LONDON frequently has a bar above it. 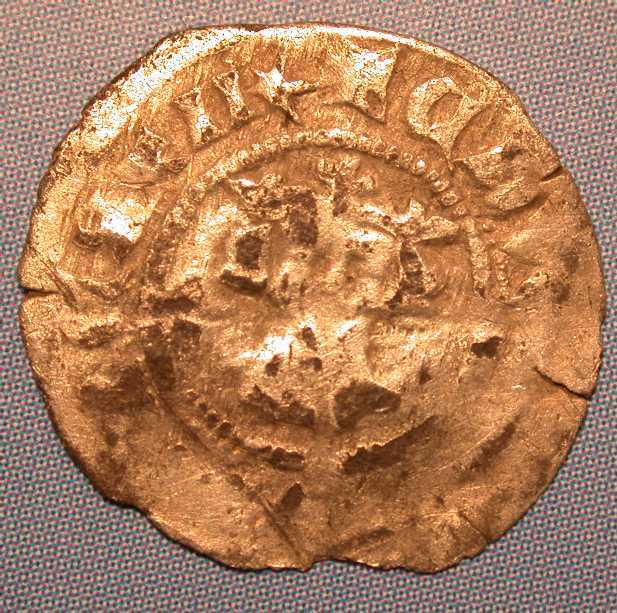 It is evident that this is also a feature of the Farthings of this period - although this is not acknowledged by Withers. hair as Type 8. Longer legend with colon stops. 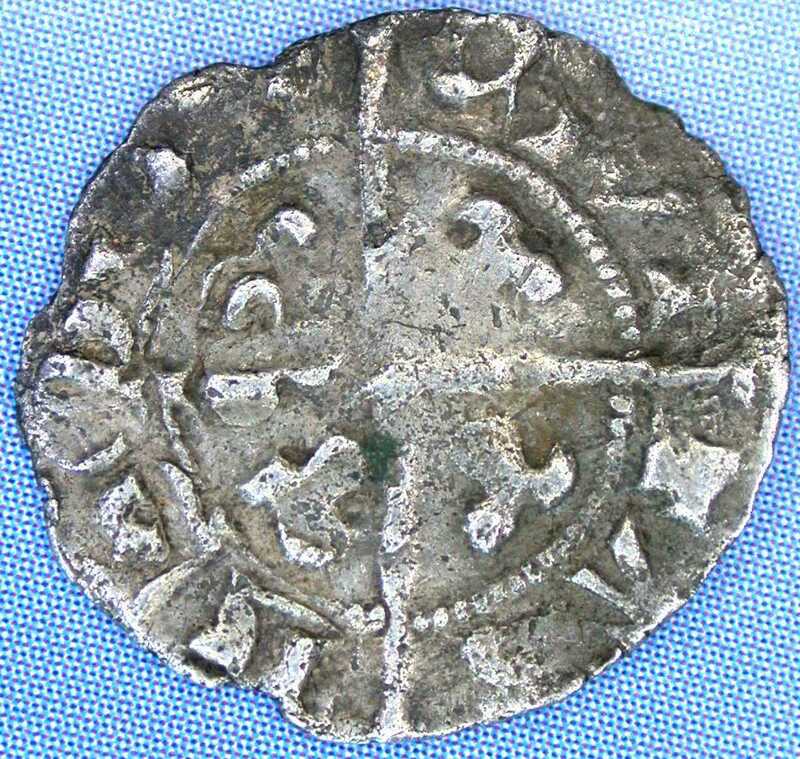 Lombardic N.
Roman N's - reverse barred. hair as Type 8. Longer legend with colon stops. ROMAN N.
and a pellet after AnGL. 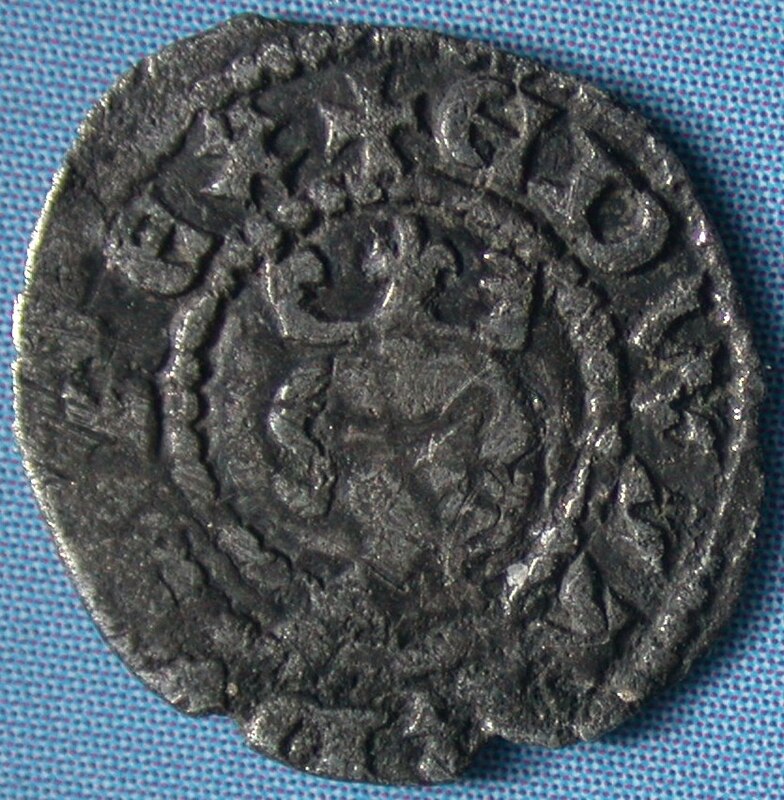 Lombardic N.
and an apostrophe after AnGL. 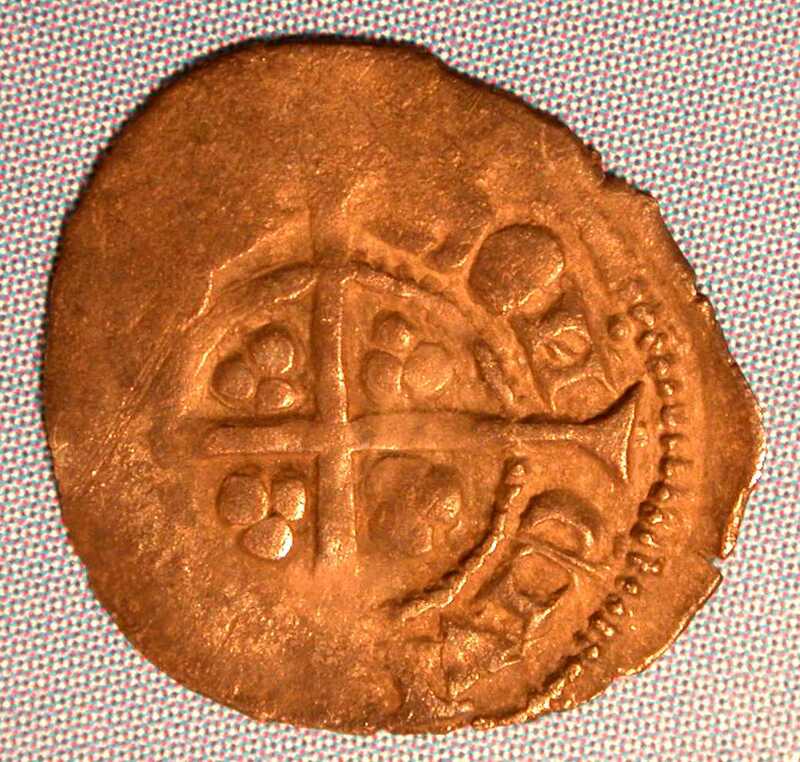 Roman N - reverse barred.